LESLIE VERNON was football journalism’s European expert in the 1960s and early 1970s. Information on this gentleman is scarce, but for some reason I assumed he had some sort of link with Hungary. Somebody told me he had come to England in the mid-1950s during the Hungarian uprising. I had an image of this pencil-bearded academic schooled in the football wisdom of Ferenc Puskas, Willie Meisl and assorted Viennese coffee house experts. He could, however, have come from Acton or Hounslow for all I know! Nevertheless, Leslie Vernon provided some insight into football across the English Channel and deep into Mitropa territory. He was always championing Hungarian football, well into its decline from the mighty Magyars. In 1968, Vernon named “My European XI” for Football Monthly. It makes fascinating reading. In goal, Vernon selected Giuliano Sarti of Internazionale and Italy. Not for him Gordon Banks, custodian of England, the world champions, who had apparently, shown his weakness in games against Northern Ireland and Russia in 1967-68. Sarti, who was a favourite of famous [and infamous] Inter manager Hellenio Herrera, was capped eight times by Italy, but never played in a finals tournament. 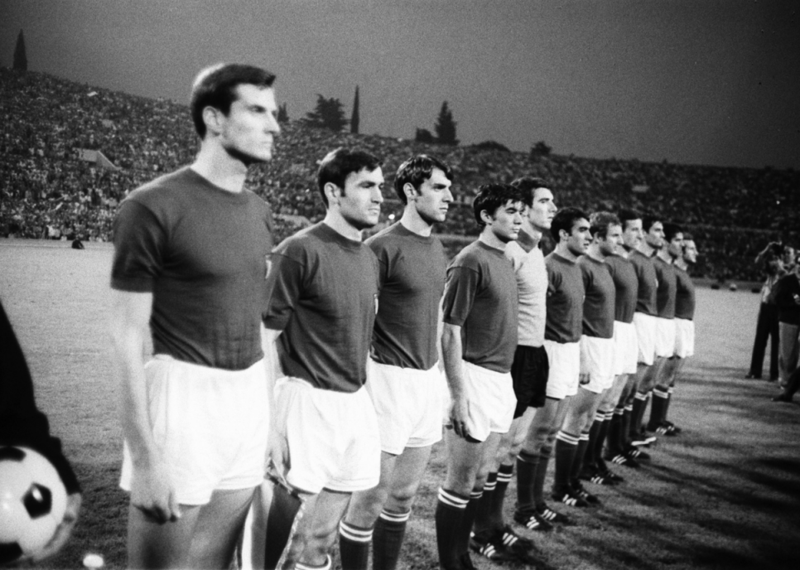 Vernon selected Sarti on the strength of his performances in the European Cup for Inter – he had outshone younger contenders like Ivo Viktor of Czechoslavakia and Spain’s Iribar. Celtic’s Tommy Gemmell (left) was named as Vernon’s right back. Gemmell was one of the “Lisbon Lions” and scored Celtic’s equalising goal (ironically against Sarti) in the 1967 European Cup final. He also netted in the 1970 final against Feyenoord, which Celtic lost. “Equally effective on either flank,” claimed Vernon. At left back, Vernon returned to Inter and selected Giacinto Facchetti (right). He was one of Europe’s first overlapping full-backs and an arch-exponent of the dreaded catenaccio system. He could also help out in attack, and in 1965-66, netted 10 Serie A goals. Such was his physical presence that Facchetti was known as “the emperor”. Nobody ever called Bobby Moore (left) the other central defender picked by Vernon, dour. But Vernon did say that Moore was a “sluggish starter”. He added: “He [Moore] reads the game instinctively and uses the pitch as if it were a chessboard.” Moore was English football’s golden boy in 1968 – World Cup winner, European Cup-Winners Cup winner a year earlier, triumphant at Wembley in the FA Cup 1964 and, of course, captain of England. And during all his best years, Moore remained loyal to West Ham United. Vernon went for a 4-2-4 formation. Florian Albert (right) of Ferencvaros and Hungary was one of the two link-men in midfield. Albert was called “graceful and clever” and in 1967, he was voted European Footballer of the Year. Converted to midfield, Vernon said Albert had “added industry to his superb artistry”. So four forwards and a wealth of talent to choose from. On the flank, Igor Chislenko of Dynamo Moscow and USSR was selected. A member of the Soviet Union’s World Cup teams in 1962 and 1966, Chislenko was the top scorer in international football in 1967. He had netted a brilliantly-taken goal for the USSR at Wembley against England, one of Vernon’s “magical moments” of the year. Eusebio of Benfica and Portugal would have been hard to leave out in 1968. His goalscoring record for Benfica, then one of Europe’s top sides, was incredible – in 1967-68 he grabbed 42 in 24 league games and went on to secure the European Golden Boot for 1968. Two years earlier, he was named BBC TV’s Overseas Sports Personality of the year, largely due to his phenomenal performance in the 1966 World Cup. “One of the most exciting personalities in football today,” said Vernon. He was not wrong and he would also demonstrate his sporting nature when he applauded Alex Stepney in the European Cup final in 1968 after the United keeper had saved a certain goal. Alongside Eusebio was Janos Farkas (right) of Vasas Budapest and Hungary. Perhaps a controversial choice, but one that underlined Vernon’s Hungarian bent. But Vernon was adamant about the qualities of the Hungarian. “A man for the big occasion,” said Vernon. Vargas had scored a memorable goal for his country against Brazil in the 1966 World Cup. Lastly, Vernon went for the 1968 European Footballer of the Year, George Best. The Manchester United legend (left) has made an impact on international football, notably in a game against Scotland in Belfast – “one of the best solo performances of the year”, insisted Vernon. Best would win the European Cup in 1967-68, scoring an outstanding solo goal in the Wembley final against Benfica. So there you have it, Leslie Vernon’s European XI. Some legends in that line-up, for sure. Who would you have picked? The Vernon XI (4-2-4): Sarti; Gemmell, Beckenbauer, Moore, Facchetti; Albert, Charlton; Chislenko, Eusebio, Farkas, Best.